Only a few years after the Higgs boson discovery, the total production cross section has been measured with 15% accuracy, and the Higgs boson mass with 0.2% accuracy. A strong contribution to this rapid progress came from the Higgs to di-photon decay channel, whose branching ratio is nearly maximised at the? ?Higgs mass of 125 GeV. The high di-photon mass resolution, signal selection efficiency and simple background estimate make this channel a golden mode for Higgs precision measurements. Our group is strongly involved in all aspects of Higgs boson property measurements in the di-photon final state. These include the measurement of the Higgs boson couplings to SM particles , the measurement of the Higgs boson mass and width , and measurements of differential distributions and their interpretation . The plots below show the di-photon invariant mass which is used for the signal extraction, and an example of a measured differential distribution, the number of jets produced in association with the Higgs boson. "Measurement of Higgs boson production in the diphoton decay channel in pp collisions at center-of-mass energies of 7 and 8 TeV with the ATLAS detector", G. Aad et al. [ATLAS Collaboration], Phys. Rev. D 90 (2014) 112015. 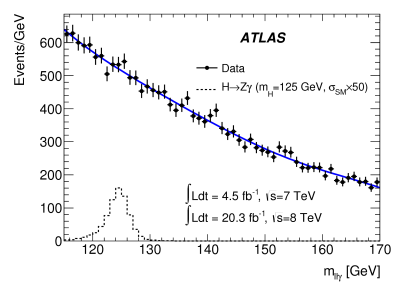 "Measurement of the Higgs boson mass from the H → γγ and H → ZZ* → 4l channels with the ATLAS detector at the LHC", G. Aad et al. [ATLAS Collaboration], Phys. Rev. D 90 (2014) 052004. "Measurement of fiducial and differential cross sections for Higgs boson production in the diphoton channel at √s =8 TeV with the ATLAS detector", G. Aad et al. [ATLAS Collaboration], JHEP 09 (2014) 112. 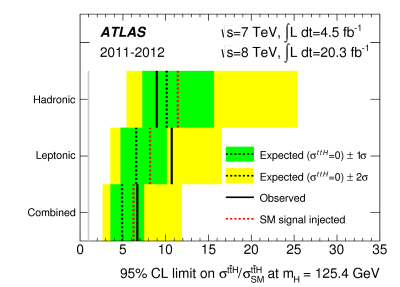 The Z(ll)γ decay is predicted by the SM, but it could not yet be observed during the LHC Run 1 due to a branching ratio which is more than an order of magnitude smaller compared to H → γγ. The analysis uses very similar techniques as the di-photon decay channel, where a narrow resonance is searched for in a steeply falling background contribution. With the larger luminosity and further sensitivity improvements, this decay might be observable with the LHC Run 2 dataset. "Search for Higgs boson decays to a photon and a Z boson in pp collisions at √s = 7 and 8 TeV with the ATLAS detector", G. Aad et al. [ATLAS Collaboration], Phys. Lett. B 732 (2014) 8. Another area of Higgs physics where the DESY ATLAS Team participates is the production of the Higgs boson in association with a pair of top quarks (ttH). In Run 1 this was mainly in the di-photon decay mode . The ttH production cross section will increase by a factor of 4 when moving from 8 TeV to 13 TeV collisions. The measurement of ttH production and of the top Yukawa coupling are among the highest priorities of the LHC Run 2 physics programme. Though in Run 1 the largest sensitivity was due to H → bb decays, with the increased luminosity the leptonic and di-photon decay modes will strongly increase in the overall contribution to the experimental sensitivity of this production mode. In Run 2 our team will participate in the measurement of the top Yukawa coupling with H → bb and H → γγ decays. 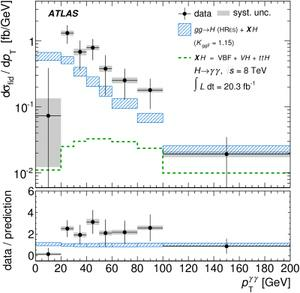 "Search for H → γγ produced in association with top quarks and constraints on the Yukawa coupling between the top quark and the Higgs boson using data taken at 7 TeV and 8 TeV with the ATLAS detector", G. Aad et al. 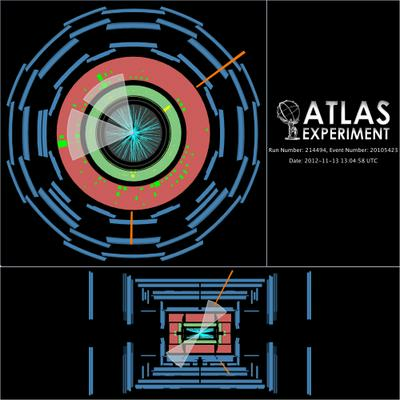 [ATLAS Collaboration], Physics Letters B 740 (2015) 222-242. Searching for additional Higgs bosons or Higgs boson production beyond the SM rate is a promising way to find extensions of the SM after the Higgs boson discovery. Our team is searching for new particles or interactions which lead to the production of Higgs bosons in pairs. Although in the SM this process has only a very small cross section, a variety of extensions of the SM predict the production of a pair of Higgs bosons at a higher rate. Experimentally, the highest sensitivity comes from the final state where one of these Higgs bosons decays to a pair of photons and the other one to a pair of b-quarks, HH → γγ bb . While the decay to b-quarks ensures a high event yield due to the large branching ratio, the diphoton decay has a very clean experimental signature and a good detector resolution which are vital to achieve the best background subtraction. An example event display is shown above in this final state (where photons are illustrated in orange and jets in white). 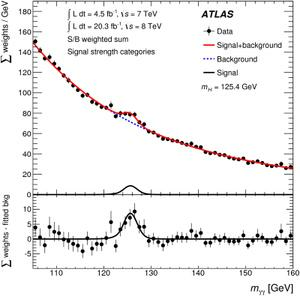 "Search for double Higgs production in the H → γγ and H → bb decay channels", G. Aad et al. [ATLAS Collaboration], PRL 114 (2015) 081802. For a direct search of additional Higgs bosons one can look for Higgs decay signatures over a large invariant mass range. It is expected that these processes will occur with a lower rate than the SM Higgs production. However the increased energy of the LHC Run 2 is ideally suited for these searches and the experiments will be able to cover an extended mass range. We participate in the search for additional Higgs decays in the di-photon signature covering a large mass range. The analysis from Run 1 set already exclusion limits from 60 to 600 GeV , and this range will be further extended to higher masses during the LHC Run 2. "Search for Scalar Diphoton Resonances in the Mass Range 65-600 GeV with the ATLAS Detector in pp Collision Data at √s = 8 TeV", G. Aad et al. [ATLAS Collaboration], Phys. Rev. Lett. 113 (2014) 171801.